The world has become a civilized place. What ? You don’t believe me? Sure there are Nightmares roaming the dark verdant forests that surround the fortified cities of Refuge, and great aquatic beasts prey on the few ships that attempt to colonize the far continent. But I prefer this new age, and as a student of history this is the greatest age of calm we Earthers have ever known let me tell you. When we Earthers still lived on Earth, yes it was a real place not just a mythical Eden as they teach in your schools nowadays, there was a great war that consumed the civilized nations of Earth leaving only the Iron Republic. The Iron Republic was a monstrous bureaucracy that tried to rule the entire Earth with its communication grids and secret police. Myth and legend hint that they were a power that originated on another Earther colony called Mars. Luckily for us, our ancestors foresaw this great catastrophe and the rich and powerful aristocracy of the former Earth nations used the greatest technological advancements of their age to seed far worlds with colonies before their exile. Refuge was one of those worlds. It is said on the records I have discovered throughout my travels of this world, that a great vessel was sent from Earth many years before the Exodus. It had on it behemoth machines known as City-makers and many men known as Technicians, some order of holy priest I assume, who were to plant dome cities all over this beautiful planet. At that time this planet was known as D-445. What is a dome city? Don’t they teach you anything of worth at these schools. Well my dear, A dome city is a self-sufficient prefabricated city enclosed in a huge shell that gathers energy from our sun to power itself. In fact if you ever feel brave, not many days travel to the south are the Two Domes, the only known fully functional domes on Refuge. Well I am wandering a bit aren’t I? The Earthers built their colony and settled in to run it For the first few months all was well. Not soon after their first annual report to their superiors on Earth, the colonists began to realize that some strange energy was emanating from the planet. Their Technicians began to fear as their machines stopped functioning. Chaos began spreading through the colony base at Chooru. They were finished in building their first two domes, but they began to lag behind as they attempted to move on to the second building site. Soon they began meeting members of the native races. They catalogued these races as semi-intelligent, and one scientist coined the terms such as elves and goblins that would forever change the nature of this pristine world. Through trial and era the worried colonists were able discern members of the crew who could successfully use the machinery without complications. Soon after other crew members realized they could do things that were considered supernatural by their fellow colonists. Rather than embracing this newfound power these “insane and highly dangerous” members of the crew were exiled from the colony as they were discovered. One such an individual was the Commissar, a rank of some power among the Earth Expeditionary Force(EEF), the protectors of the colonists. This Commissar, Enric Von Glomhammer, used his influence to declare martial law over the colony and send any dissidents with a group of technicians heading to the second colony site. He used the powerful might of his soldiers’ weapons to keep the remaining colonists under his boot heel. Many years passed this way and the knowledge of the Leyas, the strange energy, was purposely kept from the supervisors on Earth. Von Glomhammer would not let Earth command know anything of what had occurred on Refuge. The Tyrant Von Glomhammer did not expect the war that broke out on Earth and kept to his studies into the energies that were shaped by his men’s minds. It is rumored that he tried many dark rituals culminating in the sacrifice of his own son that lead to a state of immortality. His soldiers grew older and were replaced by younger colony members, but he never aged and was viewed with suspicion by the new and rebellious crop of colonists who had grown up during his reign. Back on Earth the news of the success led the Coalition of Exiled Leaders to begin project Exodus. They knew full well that their meager military forces could not succeed against the Iron Republic and its stranglehold of the Sol system. They instead pooled their remaining resources to build a spaceship capable of bringing them and the useful members of their respective countries to another planet in hopes of beginning anew. A spaceship of previously unattempted proportions was designed and was filled by the former Lords, their families, technicians and scientists to fill their scientific needs, religious leaders to fill their spiritual needs and the best trained members and best equipment of the EEF for their defense. The knowledge of how many people left on the Exodus has been muddled by myth and legend. They were a brave group and one cannot help but look at them as our true forefathers. The colony was warned of this huge exodus. It was unknown how long the flight would take, but the Tyrant Von Glomhammer was prepared to subjugate them the second they arrived. His black thoughts of extending his self-proclaimed Empire to extend the length and breadth of the planet led to his fall, however. He sent his assistant, Amir Donovan of Vorik, to establish a weapons manufacturing plant at Dumbar. It was quickly realized that they lacked the raw materials, especially iron ore, to manufacture enough weapons to subdue the arriving Earthers. The reports I have read say that Amir Donovan became disheartened by what he thought was the further mental collapse of his leader. When he discovered the extensive resources located near Mt. Tabarrd, he claimed the land as New Vorik and set to depose Von Glomhammer. The rebellion lasted for many years and Amir Donovan, was succeeded by his son Vandesh Vorik. During the reign of Vandesh, the rebels finally stormed the High Palace of Chooru and using Vorik-made weapons defeated the EEF. Von Glomhammer fled to the north. Now tell me wasn’t that so much more violent and barbaric than now? Now I’m getting on in the years and I don’t tell a story like I used to. I’m sure I’ve just bored the hell out of you. Eh? you actually want to hear more? Well as you can probably guess the Exodus landed without fail. The equipment and manpower was unloaded from her and the Lords moved into their spacious dome cities. 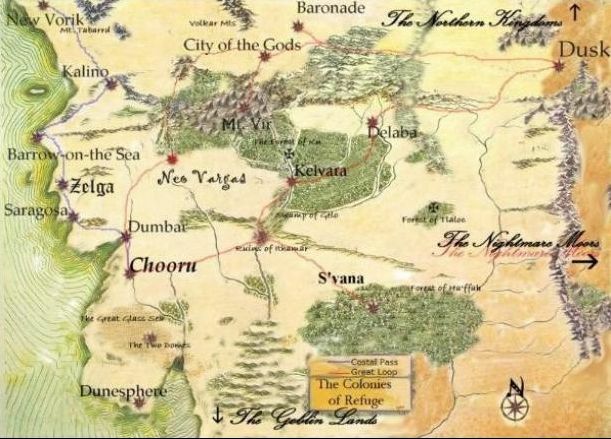 Many of their scientists and technicians moved to the cities of Chooru, Dumbar, and the newly formed city of Saragosa where a genetics factory was set up to introduce Earther creatures through cloning and other methods. The first years were ones of peace and prosperity. Though much confusion arose as the obvious effects of the Leyas were felt by these unaware uninformed Earthers. The colony nights were often filled with fear as strange monstrous creatures roamed the cities’ streets. A Free Earth Army(FEA) was formed to hunt these monsters. These brave soldiers were the crème of the EEF who had survived the final wars between Earth and the Iron Republic. Many beasts were killed by FEA forces but the monsters seemed to multiply at absurd rates. Perplexed the FEA sent Nomad city transports, great battle barges that hovered above the ground, out further and further to discover the source of these nightmarish beasts. They came back with tales of strange and fantastic creatures, many that seemed drawn right out of the Earther fairy tales. The majority of the FEA was battle hardened veterans and did not seem to suffer the same problems that the EEF grunts had with failing weapons and vehicles. Many of the Lords who expected an easy and peaceful life on the newly named Refuge, decided that perhaps fleeing this colony for another friendlier environment was the proper course of action. Their second choice, a colony on planet C-445, was decided and fuel was gathered. With the generators at full capacity and the fuel tanks 75% full, disaster turned its ugly head. On the fifth of the month of Delia, the anniversary of the Earther landing, the Exodus, along with its skeleton crew of 50 technicians, and miles of beautiful land were instantly vaporized as the reactor core went critical. Though myths and legends blame this on the Ever-cursed head engineer, Marcus Duprii, my studies have led me to believe that this was revenge. The deposed Tyrant Von Glomhammer was the true hand behind the sabotage in retaliation for what he sees as the cause for his lost empire. The Two Domes were located near the center of the blast and their inhabitants have been trapped inside ever since, now surrounded by a sea of glass deadly to any traveler or vehicle attempting to pass through it. With the leadership of the Two Domes cut off, the rest of the colony cities began to fall apart. The FEA attempted to consolidate its power but was thwarted by the realization that the new recruits were unable to rely on their weapons and technology, which often failed them at any time of high stress. The Earthers began branching off forming new cities and towns, but this expansion led them into territories controlled by the supposedly only semi-sentient natives such as the Olgogs(Goblins) and the K’iorn(Elves). Whereas the K’iorn were highly secretive and often hid their communities from the Earthers, the Olgogs were curious and attempted on many occasions to communicate with the Colonists. Sadly this led many ignorant Earthers to mistakenly connect these strange green-furred humanoids with the creatures that roamed the streets of their towns at night and ate their children. The outpouring of prejudice and anger led the FEA garrisons to begin killing “Goblins”, as they called them. The native Olgogs began fleeing their ancestral cave dwellings and traveling southward to the lands beyond the Earther colonies. Those that stayed were almost completely wiped out. Two tribes of southern K’iorn who had lived in peace with the Olgog traveled to the closest Earther city to beg for peace on behalf of the Olgog species. Unluckily the closest city was Dunesphere, a city that had erupted into a religious civil war over the issue of accepting these native creatures into their Universal Church. Militants within the Church met with the K’iorn and denounced them as demons. With the unwilling help of the FEA Garrison stationed there, they captured all but one member of the two tribes and burned them all at the stake for witchcraft. The pacifist members of the Universal Church along with the now disgusted and disheartened FEA Garrison left Dunesphere to the militants. These militants formed the reviled Church of One. While these terrors were happening the Two Domes slumbered in ignorance. Greedy Lords formed corporations for controlling the limited food and raw materials that were transported into the city by brave miners who traveled out to mine under the glass sea and ecologists who grew great storehouses of food in the lower levels of the domes. Connected by two huge tunnels the Two Domes became a place of forced ignorance. As the population grew the Domers with connections and resources lived in the more habitable upper levels while the poor and forgotten lived quick and painful lives in subterranean networks of streets. I wouldn’t be surprised if they live that way still today. Centuries passed and chaos reigned supreme. Wandering adepts not fully understanding the power they wielded brought many cities to their knees. Most died painful deaths either from other adepts or from being killed in their sleep. The geneticists at Saragosa began to understand the creatures that preyed on the people at night. The Esteemed Dr. Samuel Celina spread the word that there was in fact other parallel dimensions that intersected with our own. He theorized that the energy drifted into our reality and could somehow affect and be affected by human and possibly other creatures’ minds. His successor the Honorable Samanza Le’orn, discovered that certain humans were unaffected and unchanged by interacting with the extra planar energy, she coined a term for these rare individuals, the Immutables. It appears to be a genetic trait according to her study. Well enough of boring bookworms right? How about some more talk of conquering kings? One such man was the son of Governor-General Antonia Salonai of Kalino. Under her tutelage, Caldon Salonai, rose quickly to succeed her as Lord of Kalino. Since the year 237 AR (After Refuge) wars had been raging between Kalino and New Vorik and their respective townships. It is said that Caldon Salonai declared publicly that he would conquer the world in the name of Kalino when he claimed the title of Lord of Kalino. The year was 376 AR and Caldon, now thirty, had made treaties with his southern neighbors and beaten back the forces of New Vorik, leaving Koshep Vorik the leader of New Vorik with nothing more than the capital city and the mines at Mt. Tabarrd. Using the extended land and resources Caldon bribed FEA garrisons located throughout these northern colony lands to join him. In his unflinching and stubborn methods of ruling he was dubbed Caldon “Irons”. He further enhanced this image of himself by fortifying Kalino with large underground food vaults where nutritionally enhanced lichen and fungi are grown, and by reactivating the forty foot armored wall topped by 30 dual- plasma cannons that surrounds Kalino. It is still an intimidating site to see to this day. Caldon Irons then sent out soldiers to conquer the cities of Duolos and Zaptha and made it as far south as the city of Dumbar. The remaining FEA loyal not to one particular city but representing the free rights of all Earthers and led by General Leo Moloko, headed off the forces of the self-proclaimed Iron Empire. Apparently Caldon Irons thought the reference to the ancient evil Republic that forced the Earthers to flee to Refuge would strike terror into his enemies’ hearts. As the FEA battled back the forces of the Iron Empire years passed. Finally in 400 AR the Iron Empire were driven back northward stopping only to sack and burn Zaptha to the ground. As they reached the city of Duolos the forces of the FEA caught up with the Iron Empire and they battled for four full days. Emperor Caldon Irons, himself, led the reinforcements to secure Duolos. Through later conversations with the survivors it was realized that a technological war could never be waged again. The higher the technological level of a weapon, vehicle or battle suit the more likely it would betray its user. The cry for Immutables became fiercer as the realization that only they could use the devices that made the Earther colonists mighty. Many fled rather than be conscripted into local armies as “heavy-weapons experts”. The frontier town of Dusk grew as a haven for peaceable Immutables. The leaders of the Earther colonies quickly learned that the K’iorn could somehow speak our language using the planar energy, which they called the Leyas. Peace treaties were made between the K’iorn of S’vana and the Earther Colonies. Many Earther lords learned of the nature of the planes as the K’iorn knew them. They also learned that the distant cousins of the K’iorn, the K’iou(Dwarves) lived in the great mountain kingdoms of Vir. From the years 450 AR to 1250 AR, Peaceful meetings were held with the native races and many Kumfei(gnomes) and Baribur(winged ones) came to live among the human lands. With the native races came such inventions as the springshot, a weapon that fired quarrels by way of a coiled spring, and riding beasts such as the Mal’ie, long-legged horned lizards. They also brought knowledge of the Leyas and how to harness it. Though close-minded groups such as the Church of One still persecuted Leyas users, the society of most colonies began to encourage the study of Leyas use. Wards were set up in major cities to guard against natural disasters such as earthquakes and fires. Low tech weapons such as swords and spears, became the staple of defense for the typical citizen. Ancient records of low-tech weapons that were kept on file at places like Dumbar were perused by scholars. People learned to not travel alone at night unless well armed because the creatures that stalked the night were actually creations of their own imaginations given shape by their fear and the Leyas. Learning the true nature of the Nightmares, most Earther communities publicly apologized to the Olgog tribes and invited them to return to their ancestral homes. The Olgog returned with larger more human-like creatures leading them. These creature were often called by the derogatory name of Hobgoblins, but they showed humans how fast creatures could evolve when another’s creatures will forced the Leyas on them. Smarter and Stronger than the average Olgog, these creatures were more than a match for a human. Luckily, despite the genocide, many harbored no ill will towards the Earthers. Many new cities sprang up and some older ones died out. With the travel passing along its routes the cities of Neo Vargas, Kelvara and the City of the Gods became major centers of commerce. Life was good and many prospered. In the year 1576 darkness appeared once again on the horizon. During the Learning ages many powerful adepts traveled north past the common boundaries of the Earther colonies and met with a group of Kumfei who called themselves the AT’lal Ni, or Lords of Cold. Together with the Lords of Cold these humans founded a set of baronies each led by a Grand Magi. By the year 1576 AR, the Northern Kingdoms, as they were collectively called, were in a famine and the Grand Magi I’tash decided to raid the Earther colonies for food, mineral wealth, and slaves. Like a swarm of insects they swarmed from the northern wastes. Wielding the Leyas like a sword they cut deep into the Earther colonies. Their Mal’ie cavalry and slammers razing the cities of Baronade, New Vorik, City of the Gods and Dunkust as well as the K’iou communities of Var’ Nakul, and Beke. An allegiance between the K’iou and the Earthers turned the Northern Kingdoms back at the edge of the forest of Kn. The defeated Northern Kingdoms returned home, however, with thousands of slaves and enough booty to fill many war-wagons. They attacked again in 1879 AR making it only as far as Baronade. By 2007AR the cities of Baronade, the City of the Gods, and New Vorik were completely rebuilt. It is said that with the money and slaves they captured the Northern Kingdom have created such wonders as ships that can fly and tunnel through the ground using only Leyas as its power source. They have great lighted cities that are never in fear of nightmares and are patrolled by adept-warriors who could best even an Evil Quall N’drone in battle. But that might all merely be rumor. Moors that reside next to abandoned domes, the cities of Doyest Vesk and Deldoroon. I mean there are always places of adventure to find. Deep caverns once inhabited by Olgog or K’iou now the home to ancient undead adepts who live off the life-force of others. Abandoned monasteries of the last two thousand years holding untold treasures and dangers. Crashed scout ships filled with ancient technologies that would earn an adventurer a pretty penny.